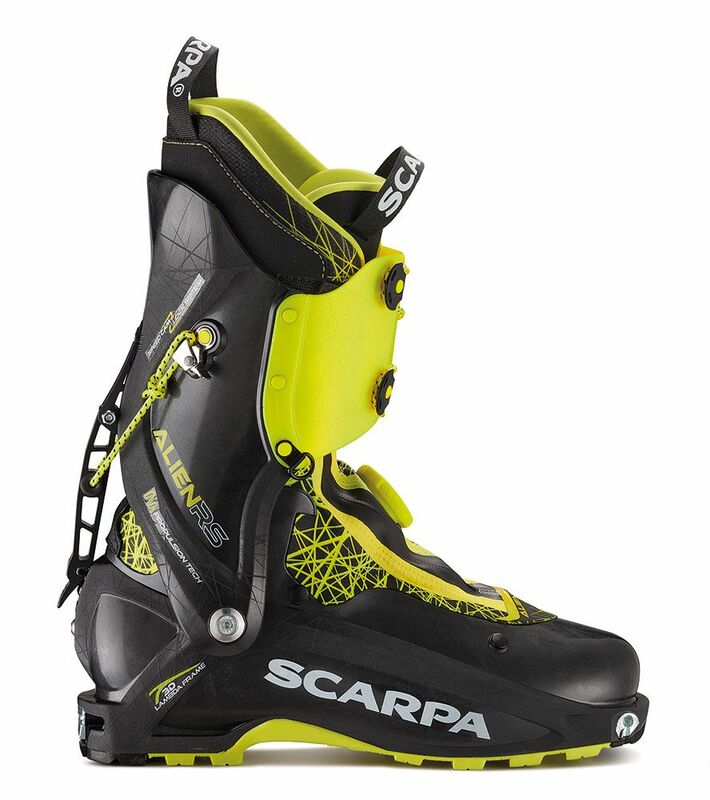 New last season the Scarpa Alien RS is a super light ski touring boot for fast and light mountain adventures. Based on Scarpa's popular Skimo race boot the Alien, the Alien RS has been equipped to be more suitable for ski touring and ski mountaineering, not just Skimo racing. Made with Grilamid LFT, a lightweight nylon with long fibres of carbon to add strength, and featuring reinforced areas of the shell to reduce unwanted shell deformation, the Alien RS give excellent ski support (approx 95 flex) for the minuscule 890grams per boot (1.78KG per pair). The Alien RS now feature a waterproof gaiter around the Boa mechanism which is s real improvement on the standard Alien for ski mountaineering away from the race circuit. With a simple and effective one motion speed lock walk ski mechanism the Alien RS can be easily switched between walk and ski mode. A stunning 72dgrs range of motion in touring mode means that you will barely feel the boots when skinning or hiking. As you'd expect from Scarpa the Alien RS is packaged up with a high quality Intuition liner with gives great fit and insulation. They have a 99mm last at M27 giving a good close fit and it is still possible to make shell modifications but they must be done carefully with such lightweight boots. The new Scarpa Alien RS is the next step forward in super light ski touring boot technology, an excellent boot for fast and light ski tourers and mountaineers.